On a desert island in the heart of the Galapagos archipelago, where Darwin received his first inklings of the theory of evolution, two scientists, Peter and Rosemary Grant, have spent twenty years proving that Darwin did not know the strength of his own theory. For among the finches of Daphne Major, natural selection is neither rare nor slow: it is taking place by the hour, and we can watch. In this dramatic story of groundbreaking scientific research, Jonathan Weiner follows these scientists as they watch Darwin's finches and come up with a new understanding of life itself. The Beak of the Finch is an elegantly written and compelling masterpiece of theory and explication. It is said that God knows the fall of a sparrow, but Peter and Rosemary Grant know the fall of every finch on Daphne Major, a tiny uninhabited island in the Galapagos. For decades they have been conducting a meticulous study of "Darwin's finches", several closely related species of finches on the islands, and have conducted one of the very few studies tracking natural selection and evolution of vertebrates, or of any species in the field rather than in the lab. Every finch is banded and meticulously measured, and the change in various traits documented over the generations. It is impossible to read this book and not come away with an appreciation for the power of natural selection. One of the details I hadn't appreciated is that evolution isn't just slow because changes are tiny, but because most of the time there are a variety of selective pressures pushing in different directions. The Grants observed a measurable and statistically significant change in the average beak size of the finches in response to a single catastrophic drought; however, a few years later, a massive El Nino produced another measurable effect in the opposite direction. So evolution dithers around the current average conditions, but several drought years in a row -- perhaps the result of climate change, for instance -- could produce a measurable effect much more quickly than I imagined. One of the best forays into evolutionary biology. An excellent job at both explaining the process of evolution, changes that can be observed, and personalizing the experience by feeling like you get to know the researchers behind the science. Phenomenal science writing. This a very well-written, meaty book. Many examples of evolutionary change that happen, even over just a generation or two. Excellent and deserving of the Pulitzer. If you have ever had any question about the reality of evolution, read this book. I walked away with a clear understanding that it is not a question of faith vs. evolution... evolution just is. This is one of the best books on evolution for people with no background in science that I’ve read. Weiner, a science writer, illustrates Darwin’s theory with examples from the work of contemporary biologists Peter and Rosemary Grant. A must-read if you’re contemplating a Galapagos trip. The Beak of the Finch: Brilliant writing and organization shows that evolution can occur in as short a time frame as two years. Never boring. The non-scientist will find this book of our changing world a good read. I had not imagined a book could be this eye-opening. It truly adds to one's understanding of how evolution works. Read _The Origin of Species_ first, or at least get a solid grounding in Darwin's ideas about natural selection and evolution. A good scholarly book that explores those finches that have evolved in isolation from similar species and which set in motion the evolutionary thinking of Charles Darwin after his visit to the Galapagos Islands. Good read. A bit slow in parts, but a nice example how thorough science works. This is the book that really makes clear to me, a science novice, how evolution works. Interesting back story, clear writing, concise explanations. Islands are the perfect laboratory for studying a species. In the case of the Galapagos archipelago, the islands are isolated like a fortress; no one can easily arrive or depart. Princeton University biologists Peter and Rosemary Grant, along with their daughters, take a small group of scientists to help them investigate Darwin's finches. By the beak of the finch they are able to track an evolutionary journey through time. Beak of the Finch is an extraordinary account of survival of the fittest as it happened then; as it is happening right now. Our world is constantly evolving and adapting and we aren't done yet. Word to the wise - listen to this on audio. John McDonough does a fantastic job. Weiner's writing may be approachable science, but McDonough's reading makes it all the more enjoyable. I had to read this for Core Bio in college. Did they think that, just because we weren't science majors, we would like to read entire books about science and write papers on them? I based my paper off the index. I don't think I did so hot on that paper. When in 1859 Charles Darwin published The Origin of the Species, he launched a storm of controversy that roils to this day. Scientists of his day were hardly convinced of Darwin's theory of "natural selection". During his years of study, research, and contemplation, Darwin amassed a mountain of evidence that evolution has happened. But the fact is that he never saw it happen. It may metaphorically be said that natural selection is daily and hourly scrutinising, throughout the world, the slightest variations; rejecting those that are that bad, preserving and adding up all that are good; silently and insensibly working, whenever and wherever opportunity offers…. We see nothing of these slow changes in progress, until the hand of time has marked the lapse of ages, and then so imperfect is our view into long-past geological ages, that we see only that the forms of life are now different from what they formerly were. 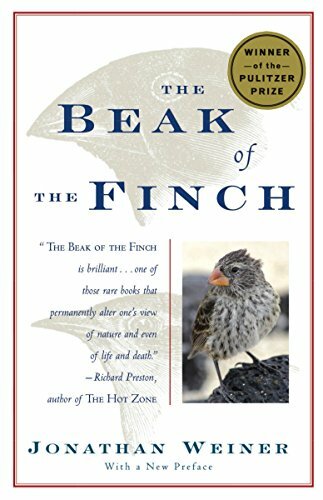 [The Beak of the Finch], published in 1994, tells of a long-term (and still ongoing) research project that reveals evolution in action. Written by Jonathan Weiner, a teacher of science writing at Columbia University's Graduate School of Journalism, the book was awarded the Pulitzer Prize for general nonfiction in 1995. It's entirely readable. And it's an important report on what scientists now have observed about how natural selection works. The project was launched in 1973, when Dr. Peter Grant and his wife and research partner Dr. Rosemary Grant, accompanied by several post-doctoral assistants, traveled to the Galápagos archipelago, and settled for a couple of months on a small, deserted, volcanic cone jutting from the ocean. Daphne Major, the Grants' island laboratory, has little vegetation but it's inhabited by frigatebirds, boobies, mockingbirds, hawks, and--most important--several species of finches, collectively known as Darwin's Finches. What the team did was capture, measure, and band every finch. The species of each finch was determined, and measurements of the birds were meticulously recorded in special waterproof notebooks. Meteorological data likewise was recorded daily. Close observation provided information about what the different finches ate, breeding preferences, longevity, and so on. At the end of the season, the Grants returned home and keyed their data into a computer. They wrote scientific, academic papers describing their findings, gave lectures, taught in colleges. Most important, they repeated the enterprise year after year for two decades. They lived with and recorded the finches through the worst drought, a year in which many of the birds died of starvation. They collected data through the wettest year. And each fall, back at college, the Grants would transfer their handwritten records into the computer. A computer, of course, allows a massive database to be searched and sorted, and facts pertinent to questions, propositions, ideas, and theories are put at researchers' fingertips. There are about nine thousand species of birds alive in the world today….Flamingos' beaks have deep troughs and fine filters, through which the birds pump water and mud with their tongues. Kingfishers' beaks have such stout inner braces and struts that a few species can dig tunnels in riverbanks by sailing headlong into the earth, over and over again, like flying jackhammers. Some finch beaks are like carpentry shops. They come equipped with ridges inside the upper mandible, which serve as a sort of built-in vise and help the finch hold a seed in place while sawing it open with the lower mandible. According to his [Darwin's] theory, even the slightest idiosyncrasies in the shape of an individual beak can sometimes make a difference in what that particular bird can eat. In this way the variation will matter to the bird its whole life…"
A bit outdated as there has been a lot of new information on evolution since this book's publication, but it remains an excellent book about evolution and natural selection. In addition to clearly stating the evidence, Weiner presents a very interesting story of the researchers. Nearly everyone has heard of the Galapagos Islands and the finches which sparked many of Darwin's theories of evolution. This is an in depth look at the evolution of these finches and the continuing selective pressure they are under as they continue to evolve, season by season, as each year brings a bit different conditions to these islands. Most of this is seen through the lens of Peter and Rosemary Grant, two dedicated scientists who have devoted their careers to the teasing out the secrets of evolution as shown by these birds. It's not just about finches, though, as later chapters deal with topics such as climate change, pesticide and antibiotic resistance. One of the finest science books that I have read. Read this right before a trip to the Galapagos and am so glad that I did. You'll never look at a finch the same way again!